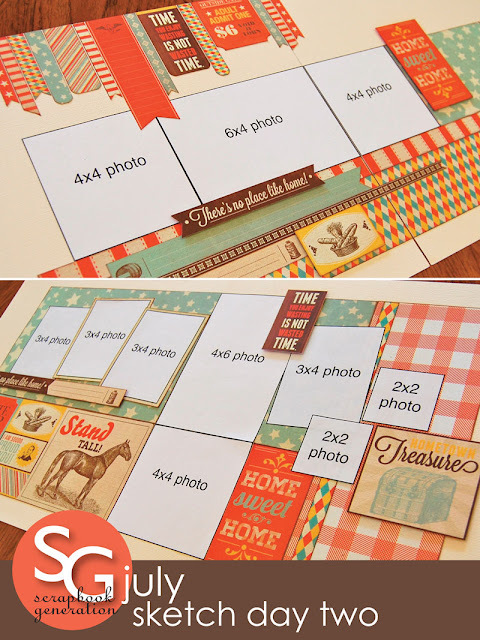 SCRAPBOOK GENERATION: July's Sketch Day Two layouts! We hope you can join us Saturday, July 20 for Saturday sketch sessions by Debbie Sanders (top layout) and Allison Davis (bottom layout). • Pay for papers used -- the total usually comes to a little over $4. • If you want to make both the layouts from a particular Saturday, order a duplicate set of paper when you register. Order must be placed prior to the Saturday class. • If you want to purchase the embellishment add-on (shown below), you can order it when you register. This embellishment is not used on the layout samples shown above, but is offered for those of you who want to add another level of interest and creativity to your pages. All embellishment add-on orders must be placed prior to the Saturday class. • All kits must be requested before the class activities take place on Saturday. • Order a kit by calling 417-886-0440. • The fee for a kit is $5, and is due at the time the request is made. • If you need the kit shipped to you, the shipping charge is an additional $5.99. • The best deal for our long-distance customers? Join the monthly Super Sketch Club and get the Super-Saver three layout kit, the Sketch Day One layout kit, and the Sketch Day Two layout kit (materials and sketches for five double-page layouts plus two bonus sketches) for $20 plus $6.99 shipping. • If you occasionally want to make both layouts, order a duplicate set of paper ONLINE ONLY at scrapbookgeneration.com. (Limited number of extra sets available. Once they sell out, they're gone. Click here to order. • If you ALWAYS want make both layouts, enroll in Super Sketch Club Double Up. For an additional $10 per month, you'll receive a duplicate set of identical materials for the Sketch Day One and Sketch Day Two portions of the club. (By doing this, you will be able to make both Allison layouts and both Debbie layouts that will be shown on the blog each month.) Sign up for Double Up by clicking here. • You can choose to order the embellishment that coordinates with the layouts this week. 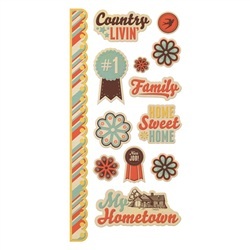 The embellishment this week is a $1.99 embossed sticker sheet. This embellishment is not used on the layout samples, but is offered for those of you who want to add another level of interest and creativity to your pages. (Limited number of embellishment add-ons available ONLINE ONLY at scrapbookgeneration.com. Once they sell out, they're gone. This add-on does not increase your shipping fee! Click here to order.